New Savingstar offer and BONUS! - A must read! There was a new Savingstar offer waiting for me this morning! It is a great one, PLUS there is an added boost to the offer. Sign up (by clicking the picture above) or log into the app, add the above offer to your list. Click on the offer and then click on the "NEW Boost your progress towards the $25 goal". 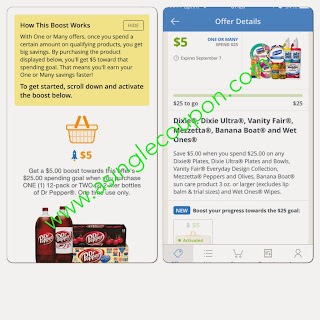 Read the terms for this offer - "How the boost works" - By purchasing the product below you will get $5 towards that spending total. That means you'll earn your one or many savings faster!" Purchase 1 12pk or 2 2l bottles of Dr Pepper, one time use and get $5 towards the $25 goal! Now that is an easy $5 especially if you buy the pop/soda on sale!